With C2E℠, you can lease the batteries and chargers as a monthly expense, and start saving valuable dollars on fuel, maintenance and labor from the day you convert. Save $6,300 per truck per year in fuel – starting day 1. Lease batteries and chargers – no upfront capital required. 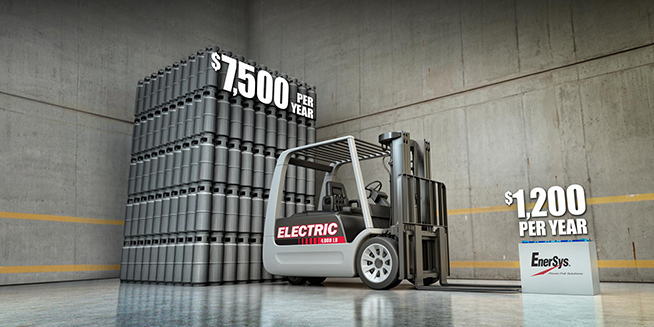 With no radiators, fluids or filters, electric lift trucks cost up to 40% less to maintain. Regenerative brakes extend service intervals, extend tire life and reclaim energy. Eliminate tank changes and save up to $75,000 a year in labor costs. On average, electric trucks hold a higher residual at the end of a 5yr lease. With no flammable gas on site, facility insurance is generally lower. Bonus: Most utilities offer conversion incentives – and we’ll help you get them. See how we make converting to electric an exercise in savings.